The Osage (in Osage: wažáže 'the water people') are a North American Indian people. The denomination Osage developed from flawed pronunciation and spelling by French and later English settlers. At the time of contact with Europeans they were living in the plains west of today's St. Louis, around and south-west of the mouth of the Osage River. According to the French Missionary Jacques Marquette, who travelled to explore the Mississippi River, in 1673 the Osage lived around the Osage River (cf. Degiha migration). In 1724 the Osage allied with the French against the Spanish for control of the region. In 1725 a delegation of Osage travelled to Paris, where among other they saw an opera and hunted with the French king. In 1801 and 1802 the Quapaw and the Osage suffered great losses in a smallpox epidemic; it is estimated that the Osage lost around 2000 lives then. Lewis and Clark related that in 1802 the area populated by Osage spread over parts of today's states Missouri, Kansas, Arkansas and Oklahoma. They called their land 'the center of the Earth' and considered themselves its keepers in the name of wa-kon-ta-ke 'The Mysterious Being of the Universe'. In the early 1800s the Osage had to convey their lands in Missouri to the United States and moved west to to the Neosho River Valley to a reservation. In 1870 after the end of the American Civil War the US government sold the reservation in Kansas and bought land for the Osage in the Indian Territory of Oklahoma. The Osage then moved to the north-east of present-day Oklahoma and south-eastern Kansas where they live to today, mostly in Osage County, Oklahoma. "Early references give the number of Osages from ca. 1700 to ca. 1775 as 4500 to 6000, including women and children. Bailey (1973) reports that there were approximately 3700 full-bloods in 1872 at the time of the removal to Oklahoma, and only 1000 full-bloods twenty years later. For more detailed information of the known Osage history please consult the Wikipedia article on the Osage Nation or other sources. War on the plains. 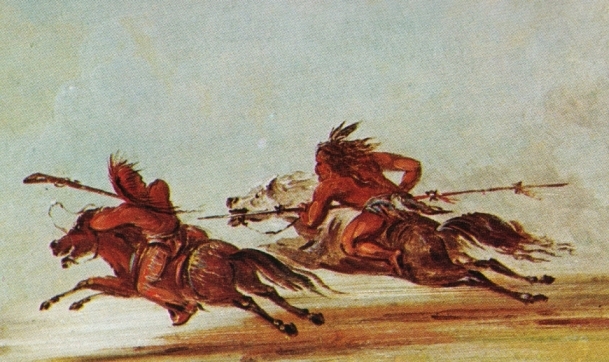 Comanche (right) trying to lance Osage warrior. Painting by George Catlin 1834. Public domain. Ledger drawing of a battle between Cheyenne and Osage warriors, 1880. Public domain. The Osage language (wažážeíe, where wažáže 'Osage' and íe 'language, tongue') belongs to the Degiha branch of the Siouan language family. Today the language is practically extinct. According to Quintero, in the late 1990s there were only a few old people left who spoke Osage fluently, all of them were bilingual and none of them used Osage in daily life. Morphology. Osage is an agglutinating language, where morphemes are combined to form words; especially the verbs often carry several various markers as part of a a complex verbal system, prefixes (pre-root), enclitics and suffixes (post-root). Syntax. Osage is an SOV (subject-object-verb word order) or verb-final language. In Osage marking is mainly on the verb, pre-root prefixes and post-root enclitics/suffixes composing the verbal complex together with the verb. The various markers which are optional by requirement of the utterance appear in a fixed order, linguistically interpretable as fixed slots for specific morphemes, before the verb root, between the pre-verb and the root, and after the root. Pre-root markers (mandatory in this order, but optional): valence (the valence-reducer wa reduces ditransitive verbs to monotransitve verbs), pre-verb, locative i (proximity), A1P (agentive first person plural), other locatives, outer instrumentals, patient (undergoer, the one who 'suffers' an action), agent (the one who acts), receptive/vertitive/dative/reflexive/reciprocal/suus marker, inner instrumentals (i.e. by hand, by pushing, etc.). Following are two Osage speech examples from Quintero (2004). Quintero also relates that there is a wide-held conception among the Osage that men and women speak differently, but she found little linguistic evidence for that, except very few lexical differences. Osage appears to be a very complex language of which many elements in its grammar are not fully understood, or subject to interpretation. Because of this high complexity and because there are unusual and very interesting language properties and elements, some of them I will treat in the future in separate posts. If you are interested, please follow the category (or the tag) "Osage". This entry was posted in Geographic distribution, Osage, Typology and tagged Degiha, history, Lewis and Clark. Bookmark the permalink.